Please help me fix this and run steam. can't auth. 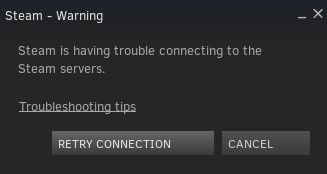 "Steam is having trouble connection to the Steam servers"
games are not updated and will not start. How to fix this? Flatpak is certainly a step in the right direction, yes. I'm not sure how well it is supported right now and not familiar with its limitations (can it install drivers, for example? ), but if it is picked up by all the major distro's then it could very wel become the distribution format that might finally make Linux acceptable on the desktop. Not sure about drivers, but it's well supported and developed by Red Hat. All major distros have support for Flatpak currently, although distros without GNOME Software Center in their repositories currently have to rely on the command-line to install Flatpaks but that's obviously going to change in the future with more GUI tools/support in other Software Centers (except for maybe Ubuntu since they favor Snap instead of Flatpak). Solus is already implementing support in their software center. Btw, have you also read my other post about InstallBuilder? 'Cause you were looking for something like that as well. Last edited by Vistaus; 01-21-2017, 06:53 AM. Don't underestimate the effect it has on software vendors. "Should we support Linux? ", someone will ask. Then someone will ask "which one?" followed by a long list of incompatible choices. This most certainly has a dampening effect on the enthousiasm of companies to actually port to Linux, and even if they do, they will choose a specific distro and stick with that. For example, National Instruments has chosen to only support Red Hat for their VISA package - I realize that's pretty darn uncommon, but for me that's the one thing keeping me tied to Windows. The software I write is also pretty darn uncommon (it's a huge closed-source package for testing spacecraft), and as it happens right now our distro of choice is Ubuntu - this was chosen by the administrators, not by me, on the grounds of it supporting some weird configuration they really like. From my point of view, I would really like to deliver my software as a generic "setup.exe" style installer that just works on any distro. I would also very much like to have the VISA package, because honestly I don't see where else we can go in the Windows "Telemetry and Unscheduled Reboots" 10 future. At the same time I'm terrified that NI will say "screw it, we stop supporting Linux altogether but the package still runs as long as it runs" (i.e. locking you into some old Red Hat version). Of course these are just two examples, but I imagine the same issues arise throughout the software industry. For better or for worse, closed source software is a fact of life, and even if software is open source, distro maintainers are not always going to include every package. For those software vendors, having a unified installation system for all distro's would make it much easier to support Linux. Precisely. That's exactly the point. Clear Linux is not intended as an example of how things should be done. It's purpose is to explore what is possible, when you remove these traditional limitations. Yes there are tradeoffs involved, which is why nobody else is doing the things they do, but it's certainly interesting to see what the real performance delta of those tradeoffs is. Besides, there are niche markets where such tradeoffs are indeed acceptable, compute nodes in a supercomputer perhaps, or embedded devices. Clear Linux is not competing with RHEL or SLES. Eh, if no one else is doing the things they do, then explain to me how Solus (Linux distro) is using some of Clear Linux optimizations. huh??? What do you mean? We allow all the normal configuration files in Clear Linux. We just separate our copy from your copy, so that you can clearly see which files you changed versus which came from the OS. How is this compromising security? When I have read the original statement it looked like you delivered the system without configuration files to save resources. So when you reconfigure compromising default settings like forcing the DNS servers to be set by the user or DHCP server before the OS lands at the end users I have misunderstood your former collegue. In this case it doesn't matter whether the configuration files are stored where they are usually and there is no reason for criticism.